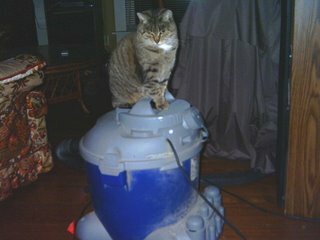 Punkinhead can now turn on the vacuum, now all she needs to do is learn how to pick up the hose and run it along the floor. Maybe she is hoping it is like an 'iRobot Roomba' and will take her for a ride all around the room. I had a cat that used to answer the phone when no one was home. She would bat at the receiver until it fell off the wall. I think she didnt like the ringing sound. Course this is the same cat that would turn on the stereo while I was at work. I worked overtime one night and came home at 2am. to the speakers blasting away. Of course the cat had walked on the controls. You can bet my neighbors loved me! The other cat knows how to shut off the alarm. He takes a swipe at it and knocks it off the table. I am on my third alarm clock.